Getting your green card can be an extraordinarily complicated and difficult task. Often times it seems so daunting that it's hard to know where to begin. Thankfully, Facebook Messenger introduced "Visabot" last year, a chatbot in the app that helps with all things immigration. Now including applying for your green card. The app launched for the first time shortly after the US presidential election in response to the president's promise to crack down on immigration laws. 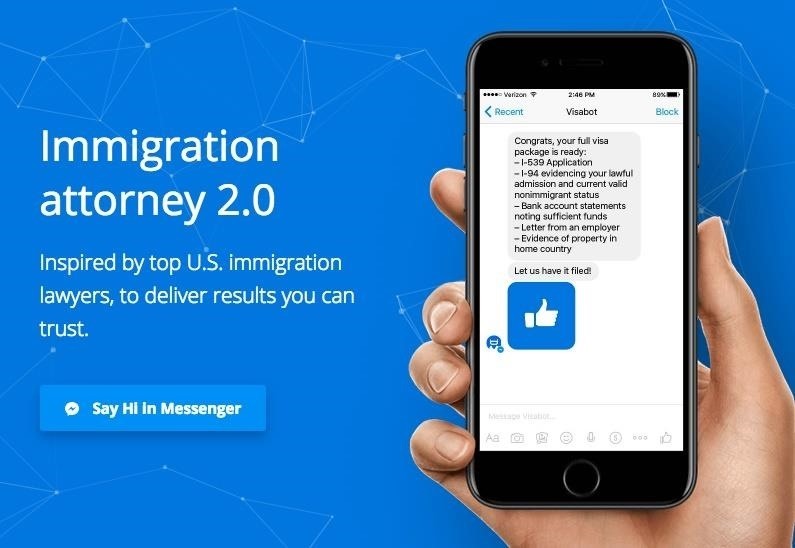 Titled the "Immigration attorney 2.0", the bot is a fluid, easy way to get information on the best ways to apply for citizenship. The green card service is $150. It uses AI to guide you through the application process and also immediately lets you know whether or not you qualify for a green card. It also sets up appointments and arranges your schedule for medical examinations and interviews. It also will guide you through the order of these documents. We created our own immigration AI so our success rate grows as the bot learns. What you need to do is answer 'are you a US citizen' and other things you should know, and the bot will use this info to generate the whole package for you. All you have to do is file it with the US immigration services. VentureBeat also revealed that according to the company, Visabot has helped over 70,000 people in the US with their application process. Another new feature that has been recently added with Visabot is a service to help young immigrants qualify for the "Deferred Action for Childhood Arrivals" (DACA) program. With their programs expanding in response to what people are looking for, Visabot promises to help speed visa process along and truly make America great again for immigrants.